Through the guidance of the 4 elements. 'Au coeur de sa voix' enables us to develop and access our full vocal potential through the guidance of the 4 elements. Earth, air, fire and water are part of our beings. As we establish a balance between them, we unify heart, body and spirit – thus enabling our voice to soar. Abdo-perineal breathing - Vocal yoga and singing exercises – Anchoring exercises – Mindfulness – Interpretation coaching – Improvisation – Guided meditation – all in a fun and conviviality! Marie Trezanini is a singer-songwriter, composer and musical teacher inspired by different ethnicities. Having obtained her diploma in jazz and popular music at the Université du Québec à Montréal, she has invested herself in a wide range of artistic projects, including onstage productions, for the past 15 years. 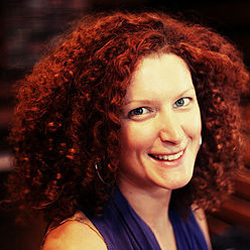 In the last 8 years, Marie has taught in music schools, such as Jocelyne Laberge, Agence ta musique, organized group trainings in France, Portugal and Québec, hosted music and yoga workshops for children, directed a choir at the Centre des femmes de Laval and offered private singing classes. She is now offering a powerful technique “Au coeur de sa voix” (At the heart of one's voice) through which she shares a number of tools to develop one's vocal potential and presence in the body – all promoting global health and well being.